Aditum Cottage in East Barkwith, near Market Rasen, Lincolnshire sleeps 8 people. Aditum Cottage near Market Rasen has over 2 acres of garden and woodland to explore; this holiday home provides an excellent location for groups and families. Set in the heart of the Lincolnshire Wolds, an Area of Outstanding Natural Beauty, Aditum Cottage provides an excellent base from which to explore this area of Lincolnshire, with the owners conveniently living on-site should you need advice or assistance during your stay. With good cycle routes and walks throughout the area, there is plenty to explore, or just sit back in the hot tub and watch the wildlife in the garden and woodland close by. There is a shop/post office and pub serving good food ¼ mile from Aditum Cottage near Market Rasen. Living room: With wood burner, 50 Freeview Smart TV, DVD player and CD player. Kitchen/dining room: With range with electric oven and gas hob, fridge/freezer, dishwasher and 50 TV. Bedroom 1: With super king-size bed, TV and en-suite with shower over bath, and toilet. Bedroom 2: With super king-size bed and TV. Oil central heating, gas, electricity, bed linen, towels, Wi-Fi and logs for wood burner included. Travel cot, highchair and stairgate. Welcome pack. 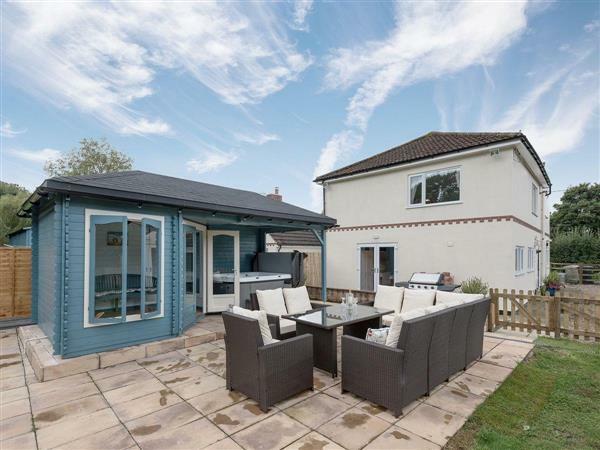 Large enclosed patio area with garden furniture and barbecue. 2½-acre natural grounds. Summerhouse. Hot tub for 5 (private). Bike store. Private parking for 5 cars. No smoking. Please note: There is a pond and a ditch 55 yards from the patio. Holidays at Aditum Cottage run from Friday to Friday. For a better idea of where Aditum Cottage is, you can see Aditum Cottage on the map below. Aditum Cottage is in Lincolnshire; should you be on the lookout for a special offer, you can find all the special offers in Lincolnshire. It's always worth checking to see what is on offer at the moment. Do you want to holiday near Aditum Cottage (UKC2311), you can see other cottages within 25 miles of Aditum Cottage; have a look to find your perfect holiday location.